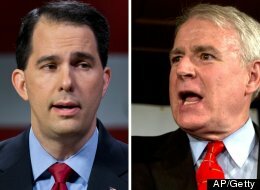 The Wisconsin recall election results have all eyes on the Badger State. Milwaukee Mayor Tom Barrett (D) challenged Wisconsin Gov. Scott Walker (R) in Tuesday’s gubernatorial contest. The final round of polls on Tuesday’s Wisconsin recall election are something of a puzzle, although the uncertainty is more about the margin separating the candidates than the outcome. While virtually all show Republican Gov. Scott Walker leading his Democratic challenger, Milwaukee Mayor Tom Barrett, they disagree about the size of Walker’s lead.Six polls completed in the last 10 days have shown everything from a 12-percentage-point Walker lead to a dead-even race. One explanation for the difference is sponsorship: Internal polls sponsored by the Democratic campaigns have typically shown a closer contest. Beyond that, although the polls differ considerably in their methods, nothing stands out to explain why some show Walker doing better than others. Five additional contests were held in Wisconsin on Tuesday. Below, a live blog of the latest developments to unfold. MADISON (WKOW) — The makeshift community of protesters against Governor Scott Walker’s biennium budget is up and running. The two-week long “Walkerville” tent city began Saturday with a kickoff event at 7 pm. “This is all part of the anger and frustration at politicians that aren’t listening to working class folks from around this state,” said organizer Peter Rickman. Protesters are calling it “Walkerville” after the “Hooverville” towns set up during the Great Depression. Overnight camping is allowed along certain streets on Capitol Square, but not on Capitol grounds. “If the people’s house is going to be closed down we’ve gotta have a presence known,” said Walkerville organizer Peter Rickman. Rickman hopes to bring back the presence everyone remembers in February. “We want to hold the politicians accountable for the bad choices they’re making,” said Rickman. Each day will have a theme. Sunday – a rally was held for K-12 education. “We’ll take this message of dignity for all workers across this state,” said Peggy Coyne, MTI President during a speech. “It’s the impact of those dollars across the state that really indicate how bad the choices are going to be,” said Mary Bell, President of the Wisconsin Education Association Council. “This budget is going to have a long lasting devastating impact on the kind of life we enjoy in Wisconsin,” said Bell. Since taking office in January, Wisconsin Gov. Scott Walker (R) has stripped public workers of their collective bargaining rights, proposed wage cuts to local government employees, and insisted that his “state is broke” and that its public workers are overpaid. But Walker applies a different standard to himself. Jerry Deschane, executive vice president and longtime lobbyist for the Madison-based Wisconsin Builders Association…bet big on Walker during last year’s governor’s race. In the coming months, we may be seeing more cases of Brian Deschanes. The anti-union law Walker signed last month also included provisions that would convert more than thirty-seven civil service positions into political appointees chosen by the Governor.